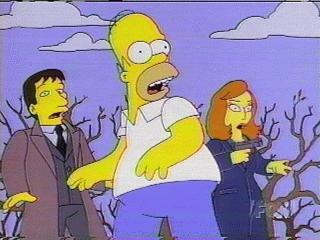 Homer: Good Lord! What is it?? Scully: It... it looks like the Links-o-Rama! But it's been so damn long since it's been updated, I'm just not sure anymore!!! I've finally decided to do a major overhaul here, so I'm getting rid of a lot of the expired links and putting in some new, and hopefully more detailed sections on the stuff I like. There'll still be links, but I'm going to try to come up with some of my own material this time (good God, that's a scary thought). Hey, well here's something kind of interesting: Most of the links on this page have expired, and in general my taste in TV shows, movies and other such has also gotten different. I suppose I shall have to change this at some point, but as has been said in the past, I just don't have the time. I'm going to update the page just for fun (and so Tripod doesn't kick me off!) Just to tell you: I now work for the federal government. If you want to know which branch, click here. Also, for you comic book fans, I have recently discovered a cool site which features some nifty art, web comics, and rant-like columns by my high school comic book supplier Brian Meredith. It's called Big Bad Hammer, and it pretty much rocks. First TV Shows, then Music, after that, Books, and finally, Movies. Click to go to the one you want. If you want other types of links (as in the UW homepage, and a whole bunch of sports links), fast forward yourself alllll the way down the page. The X-Files, which has the best relationship, platonic or otherwise, on television. Mulder and Scully have chemistry, lots and lots of chemistry, and David Duchovny and Gillian Anderson play off each other incredibly well. The official site (which I've linked you to) has some good episode summaries. For lots of cool pictures, go to the X-Files Photo Gallery, if you're a wishful thinker (as I am) you must visit the Relationshipper site, and if you're into X-Files humor, check out the X-Files Top Ten Lists by R.J. Christen (quite a nice guy). There are so many links here I just had to make my own page. Click here, and enjoy! It's got links to the free speech headquarters on the web (fight corporate greeeeed!) When I could still find the fanfic archive, I had a couple of stories on it. I'll put them up on this page when I can find where I saved them. They're not too bad. The Simpsons. Funny. And definately not just for kids. It's got great one-liners, great plot structure, wonderful, completely apt guest shots, and it's still as fresh as it was 10 years ago. And it uses cultural references in ways that are extremely funny and effective. The characters never get old, they just keep growing. It's the only show I know of where thirty different supporting characters are just as devloped as the five main characters. There's recently been episodes focusing on Monty Burns, the town millionaire and curmudgeon, Timothy Lovejoy, the town's preacher, and Principal Seymour Skinner and Mrs. Edna Krabappel, two teachers at Bart and Lisa's school. From here on in, order begins to get a little fuzzy. Buffy the Vampire Slayer. I liked the movie (yeah, you heard that right too), but the TV show is ten times wittier, funnier, and creepier than the movie was. Sara Michelle Gellar is a perfect Buffy. I've been with it since day one, and it's only gotten better with time. It's now in it's fourth season (I think). So far the only WB show to actually spawn a spinoff. 6. Angel, a spinoff that is actually as good as it's predecessor. David Boreanaz is easy on the eyes and extremely good in the role. It's darker than Buffy, but that's not to say that there isn't comic relief, in the form of Buffy's old nemesis Cordelia Chase and Cordelia's high school crush, Westley Pryce. A very good show. Links to come soon. 7. Dark Angel. It's a new show, so it doesn't always have it's feet on the ground when it comes to quality writing or acting, but the plot is pretty killer, and the action is great. Plus, it's set in Seattle (although it's filmed in Vancouver BC and you can really tell). If it lasts beyond the next few episodes, it's sure to improve. ER. Suspense! Humor! Surgery! Drama! George Clooney! Anthony Edwards! Okay, so I wasn't all that happy when Sherry Stringfield left just as she was about to discover how much her character loved Anthony Edwards', but it's still taut, minute-by-minute, life-saving action. The photo on the left is completely inaccurate now. There are only three original cast members remaining (Anthony Edwards, Eriq LaSalle and Noah Wyle), but most of the new docs are just as good as the old. Sitll going strong. Friends. There've been a few down episodes this year, and that whole Ross and Rachel thing didn't work out just the way I might have expected, but at least it was realistic. It manages to be side-splittingly funny, and at the same time deal with real emotions and problems. The one-liners on this show have me rolling on the floor at least once a week. And it has Matthew Perry. The only real problem with the show is that not everyone is as funny as Matthew Perry's Chandler. Courtney Cox's Monica is getting better but David Schwimmer's Ross is descending into Petty Pathetic Ex-boyfriend land. Click on the picture to the right for a much more satisfying view of that really cool Rolling Stone cover. 10. Futurama. Actually, this is much farther up on top, but I forgot all my HTML in the last few years, and so until I get a brush up on the basics again, I'll have to dump it here at number 10. This show is GREAT, and much too underappreciated. Futurama and King of the Hill have been dumped at an unforgiving timeslot on Sunday nights, but I'll keep watching until they're cancelled. I guess that's not too encouraging but that's the way things seem to go with shows I like. It's well written, sharp, and as satirical as The Simpsons was at it's best. 11. C.S.I. A smart, well-written and extremely tautly paced show about a part of police work that is generally forgotten about, and that certainly hasn't been portrayed on television in such detail before: the Crime Scene unit that goes in and fingerprints the crime scene and who spend most of their time on their hands and knees, looking for fibers and microscopic evidence that could break a case open. These guys tend to find the answer every time (which I'm not sure is completely realistic), but it sure does make for good TV. And an honorary spot has to go to Survivor, probably the best guilty pleasure I've gotten addicted to since the first season of the Real World. It may have been overhyped, and it may have been won by the last guy anyone wanted to see win, but it was a lot more exciting and full of suspense than most crime dramas, and it certainly had more backbiting and twisted office politics going on in it than your average soap opera. No Doubt. Catchy (again), punky ska, with a solid drum line in every single song, which is something that's practically required for me to like just about anything. Gwen Stefani's voice can grate on the first listen or two, but after that you get used to it. Her vocals on "Don't Speak" are practically understated. She can migrate from slow ballads to jumpy rock pieces without missing a beat. And their lyrics are really true. The site takes a while to load (as do most sites. What is it with Frames? What's so great about them anyway? Anyway...) Best: Tragic Kingdom. The Dave Matthews Band. The best pure musicians in rock music. Dave Matthews' voice is unique, and it's the only group I know of that combines the standard drum, bass, and guitar with violin and saxophone. The five members of the band make music that flows really really smoothly. Carter Beauford is the drummer, Boyd Tinsley plays violin, Carter Beauford on drums, Stefan Lessard on bass, and Dave Matthews does the singing and the very, very fine guitar-playing. He also rights those great, catchy songs! Best: Crash. Ben Folds Five. Since I'm not a big fan of groups who live and die by huge, thick, guitar riffs, I was thrilled when my roommate last year introduced me to this trio from her native North Carolina. They consist of a drummer, a bassist, and a pianst. If you think that sounds stupid, one listen will make you change your mind, guaraunteed. The piano riffs are skilled, and the three members of the band use their voices quite effectively as a fourth instrument. They harmonize better than anyone out there. Of course, there are only three of them, but that's okay, three is better than five any day, and Five sounds better. Best: Ben Folds Five. Go on back to the top. Kingdom Come, written by Mark Waid, painted by Alex Ross. Okay, so it's a comic book, but it's so well-done it could be counted as a novel. The writing is realistic (as it can be, these are superheroes after all), and the paintings are absolutely beautiful. Even those of you who don't like comics should visit the site. It's got lots of good shots of the beautiful paintings and some really (obsessively) detailed descriptions and synopses of the four issues of the Graphic Novel. 2. "K" is for Killer, by Sue Grafton. This is the best of Sue Grafton's alphabetical mysteries that I've read so far, but all of them are way above average. They feature Kinsey Millhone, a tough private eye who not only has a soft side, but a mysterious past. Elements from all aspects of her personality are woven into the story. They just keep on getting better. "K" is somewhat darker than previous outings, and features an ending that will catch you by surprise. It's complicated without being too confusing. read it read it read it!! The Atticus Kodiak novels by Greg Rucka Rucka's a great writer. He has a nice, tense pace, and builds great plots that have uniformly excellent payoffs. His hero is a tortured, extremely human soul with the kinds of flaws that only real people can have. Kodiak also as the interesting feature of not being a Private Eye. He's a bodyguard, and the books offer a view into a world that not many people know about, or have written about. Rucka has surrounded him with an excellent supporting cast. One of his characters, the tough PI Bridgett Logan is such a great character that he even wrote a book from her POV. Rucka also writes great comic books. I have a heavily under construction Rucka page myself. 4. Post-Star Wars Trilogy, by Timothy Zahn. These three books (Heir to the Empire, Dark Force Rising, The Last Command), combined everything that made the Star Wars Trilogy so great (and if you've ever seen it, you know what I'm talking about), with some great writing, and some incredible new characters. The plot retains a lot of the Star Wars element, while also taking on some of Zahn's own style and personality. Terry Pratchett's Discworld Novels. Possibly the most popular author in England is just now coming to promienence in America. His books are funny, satircial and extremely well written... and the guy pumps out one a year, thus insuring that you'll never want for anything! He's got an extensive universe, consisting of more great and memorable characters than most authors could even dream of creating. There are four or five distinctive series, so even if you don't want to read all 20 odd books, you can just read the ones in the series you like. Unfortunately, not all his books are published in the US. If you don't want to spend 15 bucks for each of his English import paperbacks, fear not. His US publisher is finally getting on the stick and putting all of them out (albeit with kind of unfortunate "modern" covers). Carl Hiaasen. Another great writer of interesting and humorous stories. Hiaasen wrote a book I was almost ashamed to be reading a few years ago, Strip Tease, which was made into a Demi Moore movie I haven't even bothered to watch. The book was a laugh riot, though, and I can only hope the movie was half as funny (knowing most Demi Moore movies, it probably was, but not on purpose). The other two I've read of his are Stormy Weather and Lucky You, both good books, and very fun. His version of South Florida is vivid and highly descriptive. It makes you feel like you're there, although given the number of strange and freakish incidents that happen to the state and his characters, you might almost wish you weren't. Bill Fitzhugh. Bill has written three novels, I've only read two, because I can't afford hardcovers because I'm poor. The two I read, Pest Control and the Organ Grinders are great books, funny and touching. There was a scene in the Organ Grinders that made me cry, which is kind of sad since I was on the bus hat the time. Kind of embarrasing, but it was a good book. Since I haven't read Cross Dressing, I couldn't give an opinion, but I imagine it's just as good as the first two, if not better. Bill's also a nice guy who answers all his email personally, and he's a University of Washington Alumni! Batman: The Long Halloween, by Jeph Loeb and Tim Sale. Another great comic book. It's as good, if not better, than most mystery stories, and it tells a tale of the Dark Knight back around when he was first starting out. It's populated by all the usual suspects, and includes the origin of Two Face, and the first adventures of Catwoman. It includes Commissioner Gordon, and a bunch of Gotham Gangsters, but not Robin. He's featured prominently in the next series by Loeb and Sale, though, called Dark Victory. Schindler's List. The site is actually just info on Oskar Schindler, the hero of this movie, which I can only describe by saying that it's the best movie I've ever seen in my entire life. It's realistic, at times painfully so, but uplifting at the end. Features an absolutely incredible preformance by Ralph Finnes as the Nazi Commandant Amon Goeth. He should have won the Oscar for this one, but for some reason he was shafted. Watch the movie, you'll see what I mean. Casablanca. Humphrey Bogart is *the* best actor of the 1940's and 50's. He and Lauren Bacall made some great movies, but none of them surpasses Casablanca. It's one of those classics that everyone knows about. The site I've linked up has a bunch of cool stuff about the other Humphrey Bogart movies, including Key Largo, To Have and Have Not, the Big Sleep, and Dark Passage, which star Bogie and Bacall. Key Largo's a so-so gangster picture, whose only redeeming qualities are Bogie, Bacall and Edward G. Robinson. To Have and Have Not is a *great* movie. The Big Sleep is one of my all time favorites. Dark Passage is kind of cheesy, but charming in the end. Indiana Jones and the Last Crusade. Well, actually the whole Indiana Jones Trilogy, but I think Last Crusade is the best one. Not only does it have Harrison Ford in that leather jacket, weilding that bullwhip, wearing that fedora, but it's also got Sean Connery (the One True James Bond), and more of the series' great action sequences and big action pacing. An added bonus, Young Indy showing us how he got that scar on his chin. The whole trilogy is just plain cool. The Empire Strikes Back. Once again, this is kind of for the whole Star Wars Trilogy. Some say it's hackneyed space opera, and maybe it is, but it's big action, high energy hackneyed space opera. I love this movie, and I love the whole trilogy. I can't accurately put into words how great it is. Go to the website for more info on this (if you're one of the two people alive who doesn't know all about it). There are some seriously obsessed people out there. You can also visit the Mos Eisley Cantina for full scripts and lots of cool pictures. There are hundreds of Star Wars sites on the web. So I'll shut up now, and let you go see them. 5. Addams Family Value. This comedy is so dark it's funny. It's got some awesome one-liners (written by the extremely hilarious playwright, Paul Rudnick), a really great deadpan preformance by Christina Ricci, a great psycho preformance by Joan Cusack, and typically great preformances by Raul Julia and Angelica Huston. One of the few movies I've bothered to actually buy on video. 6. Clueless. Okay, so maybe it's not an intellectual selection, but it is a really funny movie about a Beverly Hills High student, and her life, loves, friends, and fashion emergencies. Alicia Silverstone gives a dead-on well-meaning Valley girl preformance. Good movie, even though it spawned an awful TV show. 7. Well, you're finally done, go on back to the top. Or, better yet, go down a little and look at the sports links. The University of Washington Homepage: Best University in the world. Check it out! ESPNet Sportszone: The best sports sport from the best sports network. The Seattle Mariners' Homepage: Visit the website of the best baseball team in the League. Seattle Times Mariners Page: Day to day news articles on the Mariners, and other cool features by the best of the Seattle papers. Carolina Court Basketball Homepage: The Huskies, regrettably, don't "do" basketball. So I turn to the Tarheels. This page is really pretty. The Tarheels Page: A student's tarheel page. Lots and lots of articles, stats, etc.